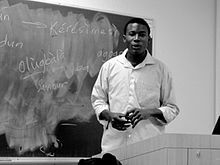 Kọ́láwọlé Olúgbémiró Ọlátúbọ̀sún (born 22 September 1981) is a Nigerian writer, linguist, and teacher. He is a recipient of the Premio Ostana Special Prize for Mother Tongue Literature 2016. He writes in Yoruba and English. Category: News, Pass Radio | Tags: PASS Lagos | Bookmark: permalink.